During the last years of the 16th century Venetian painting was largely dominated by the Da Ponte family, who were known by the name of their native city of Bassano where they worked. It was Jacopo Bassano who created the style that would subsequently be disseminated by his sons Francesco, Giambattista, Leandro and Gerolamo. Jacopo depicted biblical scenes in the manner of genre compositions, with the principal episode relegated to a secondary plane and a primary emphasis on animals, cooking implements and country people. This formula would prove extremely successful among certain social sectors and was widely disseminated in Italy and Europe around the early years of the 17th century. Bassano also developed a type of nocturnal scene based on bold effects of chiaroscuro derived from sources of artificial light. The pictorial consequences of this new approach would influence northern artists of the next century, as can be seen in a work in the present collection by Terbrugghen based on a model by the Bassano family. Finally, Bassano introduced another compositional innovation in the 1560s, of which the present canvas is an example: biblical-pastoral scenes in which a religious episode is depicted in a landscape imbued with a sense of everyday life. The present canvas, acquired in 1934, was previously in the UK. The earliest known owner was Sir Thomas Baring, who lent it to an exhibition held at the British Institution in London in 1839. It then passed to William Coningham and was auctioned on two occasions, in 1849 and 1851. The Parable of the Sower was recorded from 1851 to 1919 in the collection of the Earls of Northbrook. It was auctioned at Christie’s in 1919 and entered the collection of the Earl of Harewood. The subject has been interpreted as a pastoral or as a depiction of the Parable of the Sower. The latter interpretation was suggested in 1957 by Michelangelo Muraro who based his analysis on the figure in the middle-ground standing on the edge of a path and throwing seed from the basket on his arm. Muraro noted the presence of two birds by this figure’s side eating the seed, while a third waits its turn on a tree trunk. This New Testament subject is taken from the Gospels of Saint Matthew, Mark and Luke in which the seed is compared to the word and the sower to Christ. In contrast, Zampetti suggested that the painting could depict Autumn and form part of a series on the seasons. 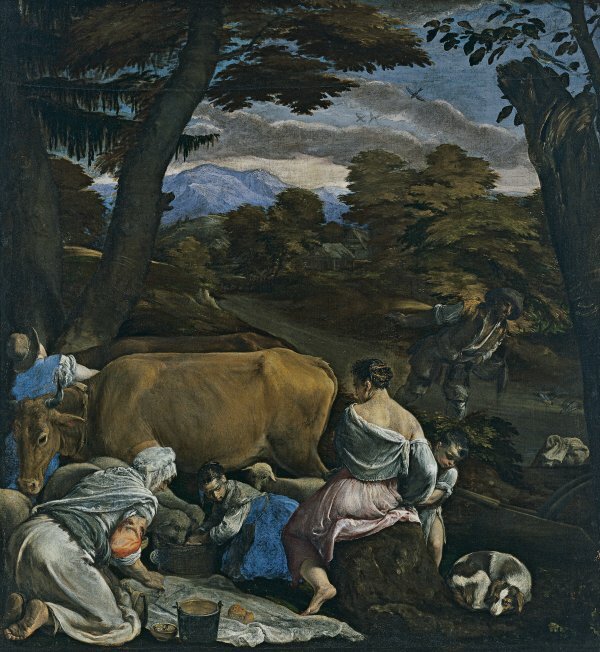 In the foreground, counterbalancing the figure of the sower, Bassano locates a family at rest on a journey, making preparations to eat. The pair of oxen, the lamb and the figures, as well as the small still life on the white cloth on the ground, are all fine example of his abilities. The canvas is also of interest for the treatment of the landscape, which is highly original despite the fact that the foliage has darkened and thus slightly distorted the overall tonality. The view has been related to the type of backgrounds found in Venetian painting of the second half of the Cinquecento. Bassano looked to the work of Titian for various elements in the composition. They include the curled up dog on the right, which is based on the dog in Titian’s celebrated Venus of Urbino, as Ekserdjian noted in 1988. He also noted that the painting is organised through a harmonious colour scheme in which the blues of the mountains and sky and the whites of the clouds are echoed in the clothes of the figures in the foreground. Heinemann drew attention to three drawings that relate to this composition: two of the ox, in the Statens Museum for Kunst in Copenhagen, and another of the sower that was in the Benno Geiger collection until 1920, the year in which it was auctioned.